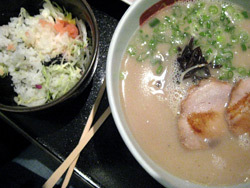 In a ramen loving town like this one, Ippudo is possibly the most anticipated – the mecca of authentic Japanese ramen. I was lucky to avoid the notorious hour long waits by going at lunch hour during the week. On my sister's advice, who visited the chain in Tokyo, I ordered their specialty : shiromaru (white broth) which is the cloudy, porky broth with intense flavor that takes 14 hours to make. I am perhaps a slightly bigger fan of Setagaya's clear broth, but this is one superb bowl of ramen. On future visits I'd like to try the shiromaru with special sauce out of curiosity. At lunch the menu offers a side dish of spicy cod roe and rice, yum. Other non-ramen dishes are available (but that's not why there are lines out the door, is it?). The atmosphere is nice and upscale with arty bamboo fixtures and natural?surfaces of wood and stone. A tranquil environment to enjoy your ramen which I prefer to stools and rushing. Ippudo is considered by many to be the only “real” ramen option in the city and “ramen king” Shigemi Kawahara is revered by ramen maniacs, (so my Setagaya comment is sure to upset some). And I can't really comment on that, as I am no expert in these matters. I do know that this meal, which runs about 12-16 dollars is worth every penny and I am thrilled to have this outpost in New York. I can't wait to go back.